If you only watch the news channel, you might believe that typhoons hit everywhere and anytime in SE Asia. They don't. Rest assured we don't go sailing when there could be a typhoon. The more detailed explanation involves learning about weather and how to defend the vessel in a typhoon. We did it the smart way, we secured the vessel in a protected harbor. 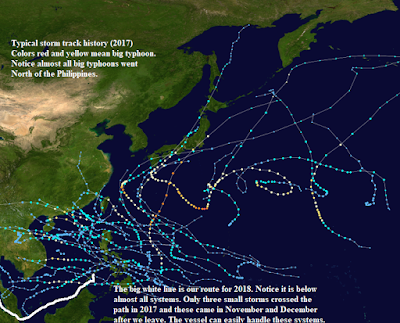 It is true typhoons can occur any month out of the year, however, where these typhoons go changes throughout the year. Further, the closer you are to the equator, the less likely there will be a typhoon at all. 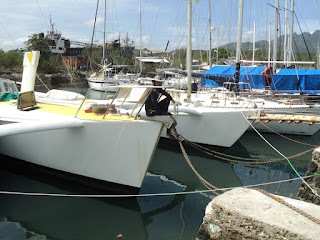 Most of the sailing we will be doing is in the Fall 2018 when we leave the Philippines and head to Thailand. During the Northeast Monsoon, the wind blows from the Philippines down to Singapore. While sailboats can indeed go up wind, it is so much more pleasant to go downwind. However, we don't want to wait too long. The longer you wait, the more likely a typhoon will track to the South. Typhoons are steered by the prevailing winds and when they start heading South, so do the typhoons. The thin blue lines are depressions and not typhoons. Further, notice that we will be sailing below where almost of these occur. In fact, the area we are going has been called the "The Land Below the Wind" for centuries. It struck in November and we leave October. It went well North of Palawan. We had days and days of notice to prepare. In fact, HOT BuOYS SV was almost hit directly by the eye itself. However, notice what is going on in the photo below. I am sitting here on the bow for a reason. The crew and I had several days to prepare for Yolanda. To keep the vessel in place I even ran chains from the bow to the shore. I certainly would not be out sailing in the eye of Yolanda. The eye hit about 30 kilometers to my North. Trees in front of HOT BuOYS SV were ripped out of the ground. Damage to HOT BuOYS was zero. Estimated winds in the harbor reached over 140 kilometers per hour. Oh, but, but, but, the nervous American is asking. "What if it really did hit your vessel directly, wouldn't it flip upside down?" Well, look at the photograph. Notice all the lines to shore. Those front ones are chains. They are designed to take thousands and thousands of kilos of load. What you don't see is in the stern of the vessel. The stern was attached to shore behind by 6 ropes. In total 14 lines were employed to hold it in place. The vessels you saw in the Caribbean were attached to one line only and they were smaller catamarans not a big trimaran. How did we get so much advanced warning? Satellites. Here is a link to a satellite feed that updates every 5 minutes. I check it regularly. The page default will be a view of the Pacific all the way out beyond the Marshall Islands. It takes up to several weeks for a storm to build and get all the way to the Philippines. Eventually, and usually long after I have already been looking at a potential storm, the Joint Typhoon Warning Center will issue an alert. Another tool I use is called Windy. You can download a great application for your phone at Google Playstore.